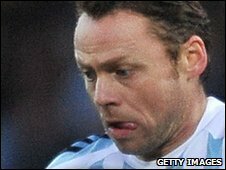 Oldham Athletic have named former Manchester City and Scotland striker Paul Dickov as their new player-manager on a 12-month rolling deal. The 37-year-old ex-Leicester forward, who has no managerial experience, ended the season playing for Leeds. The Latics parted company with Dave Penney last month after a year in charge and caretaker boss Martin Gray left the club last week. Oldham finished just two points above the relegation zone in League One. Dickov, who beat nine other shortlisted candidates to the job, is in talks with a potential assistant. Dickov told the club website: "Anybody who saw me play, probably thought I played with a bit too much passion. I want to pass on that passion and enthusiasm to the players and I want fans to see a team which at the end of the game has given its all. "I am at the end of my playing career and this is a fantastic chance to become a manager which I am absolutely delighted about. "Management is something which has always interested me. I have played for a lot of managers in my career and it has always fascinated me. have always listened and taken on board things without probably realising it. "I am not going to pretend it will be easy. I will make mistakes, but sometimes you only learn by making mistakes. "But one thing for certain is that I will be giving it my all, and I will be making sure the players here will be doing the same thing. I had a long career and was not necessarily the most talented player, but the reason I had the career I had was through hard work which first and foremost has to be the starting point. "I have to be honest with myself and accept it is going to be hard to do both jobs [playing and managing]. "I am going to do pre-season with the boys and if I feel I have something to offer I will play as there is nothing better than playing which is the best job in the world. "First of all I have to look at the players here. And regardless of what has happened in the past when the players come back on 28 June they are all going to have a clean slate and chance to impress. "And before I start bringing in players, I want to give everybody here a chance."